TPC Overall Rank: #306 out of 2933 rides. User Tracker Count: 202 times. Often times modern carousels just pale in comparison to classic, more traditional carousels by a long shot, as they just lack the charm and appeal of the older ones. Granted this is true with Island of Adventure’s stylistic and kid-friendly carousel, but this one definitely closes the gap considerably and actually stands out as one of the better carousels I’ve been on. In fact, it actually is a triumph over a good portion of the classic carousels I’ve been on! Let me start off by saying that this carousel is a beauty. Located in Seuss Landing, this carousel throws out the stereotypical horses featured on most carousels in favor of the colorful, imaginative creatures Dr. Seuss featured in his various books to great effect. Just the sheer amount of detail present on each character is amazing, something lacking on almost all newer carousels. Not only are there a wide variety of characters present, but the attraction also dons colorful, wacky vehicles in place of the traditional benches found on most carousels. They not only look sleek and stylish, but they also rock as well, a really cool and unique feature. Never at all did I see a line for this during my visit to Islands of Adventure, but I doubt lines would ever be a problem for this crowd-eater. 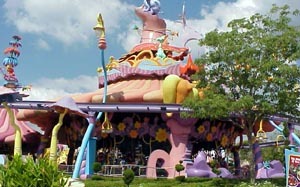 The ride definitely captures the free-spirited atmosphere of Dr. Seuss to great effect and is very enjoyable for a carousel, as the movements are smooth and the park gives a pretty long cycle considering the park’s immense size. Also, the music featured on this carousel enhanced the zany atmosphere of the carousel significantly and was a huge plus. The Caro-Seuss-el simply is one of the prettiest, most gorgeous carousels out there. And not only does it look nice, but it also is a pretty darn good carousel in terms of the ride, especially thanks to the unique rocking benches the ride features. If pressed for time, this definitely can be passed for bigger and more unique attractions, but carousel lovers should definitely save some time to check out this creative, one-of-a-kind carousel. A wonderful modern version of an old time favorite. On my second visit to this park I really enjoyed my time in the Seuss section. The first time through the park we skipped most of the attractions here, which was a mistake. I had lots of fun on this and several other rides in this part. The scenary feels exactly like a Seuss book. A theme park classic on acid. What a great collection of Seuss characters that you are able to ride and manipulate to do different things. Yes it is just going round and round and up and down, but seeing the smiles on childrens faces and the kick they get out of it makes it so much fun to ride this ride. I am not a huge fan of carousels in general, which is why I rate it only a 6, but it is a good ride for kids and families. I am also spoiled by the classic double-decker carousel we have at my home park, SFGAm. However, the theming on this ride is good, and it lets you get a glimpse of several different sections of the park. Not really good or bad, just your standard modern carousel, spiced up with the theming accorded to all of IoAs attractions. This is one of my favorite carousels I have been on I enjoyed the theming and the fact that the statues actually move and stick out their tongues. Its a little short but its alot of fun. I also liked the music its a great addition to Dr. Seuss attractions. This ride should be great, but it is not. Although there is no denying that Caro-Suess-el looks great both from without and within and showcases the Suess characters magnificently, it has two big drawbacks. First, the mechanical elements are way too hard to operate even for adults, not to mention children. (This lack of attention to what children can actually do is a theme repeated at the Cat-in-the-Hat where the spinning is too intense for small children.) Second, there is no band organ which is a big lost opportunty. A good carosel but one that seems to get over rated. This ride is well themeed. However the moving features on the "animals" are often difficult to operate, escpecially for young children and the ride lacks any kind of music maker like some very old carosels have. Good carousel, I enjoyed moving the head of my character. The ride seemed perhaps a bit short though, oh well. There was no wait, and I had a great ride.